Last Sunday, I opened the door to my pantry to give it a good scan before I began planning meals for what I knew was going to be a busy week. One look almost made starving look like a desirable alternative. Almost. Baking supplies were jumbled with dry snacks, bottles of oils and spices were tipping over dangerously and cereals were hiding way too many varieties of dried fruit, including a bag of currants which, although properly sealed, was pushing the limit of what “dried” really means. Some more scavenging revealed a discouraging amount of waste. I decided I would just have to eat and eat until my pantry regained some semblance of organization. Not a bad deal. It was in the relentless pursuit of an organized pantry that I baked this loaf at 9pm the next day after work. When I was sick last month, I opened a gorilla-sized bottle of unsweetened applesauce that was supposed to be used for a cake I never made in October. I choked down a half-cup serving – I’m not a fan of store-bought applesauce – and away it went in the fridge, set to expire 10 days after opening. I had also found a container of old-fashioned oats whose time would be up in a month. And there was Dorie Greenspan, quietly beckoning me to whip out my whisk and spatula with her Oatmeal Breakfast bread, which is composed primarily of these two ingredients. This isn’t the sexiest of recipes. It’s not accompanied by a picture and doesn’t quite jump off the page of a book with baked goods like decadent World Peace Cookies and Pear Frangipane Tart (one of my all-time favorites). But it was fate. Not to mention, it cleared me of my leftover brown sugar from Christmas and pecans from New Year’s. It used raisins, which I stock regularly. It called for a quarter cup of whole milk, of which I had exactly ¼ cup left in the fridge. Throw in some household staples like flour, granulated sugar, eggs, spices and canola oil, and I would probably would have felt satisfied eating it, even if it was a breakfast brick. But the end result was far from brick-like. In fact, this bread is precisely what I look for in breakfast. I love the homey quality of good quick breads. My family likes to slice them up and slather them with cream cheese for breakfast, but, despite my sweet tooth, I have always found them much more suited for a snack or dessert. A moist hunk of pumpkin loaf or banana bread (especially Flour bakery’s) is usually found accompanying my midmorning, afternoon or evening tea. On weekdays, anyway, I prefer something hearty and only minimally sweet to start my day. 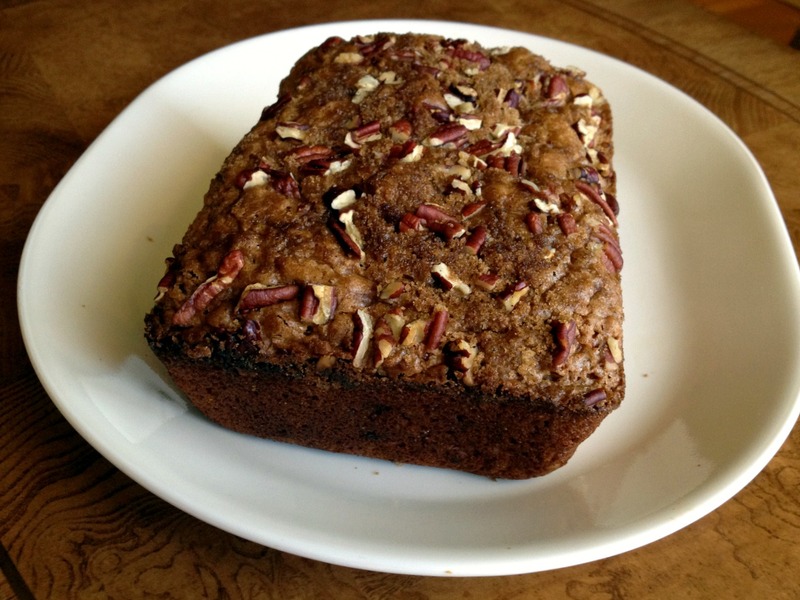 Dorie’s Oatmeal Breakfast Bread captures the warmth and flavors of a good bowl of oatmeal in a loaf pan. Applesauce keeps the loaf moist and tender, while swapping 1 cup of flour for oats makes it filling and gives it the most intriguing texture. They add heft without making a leaden, “healthfood” loaf. 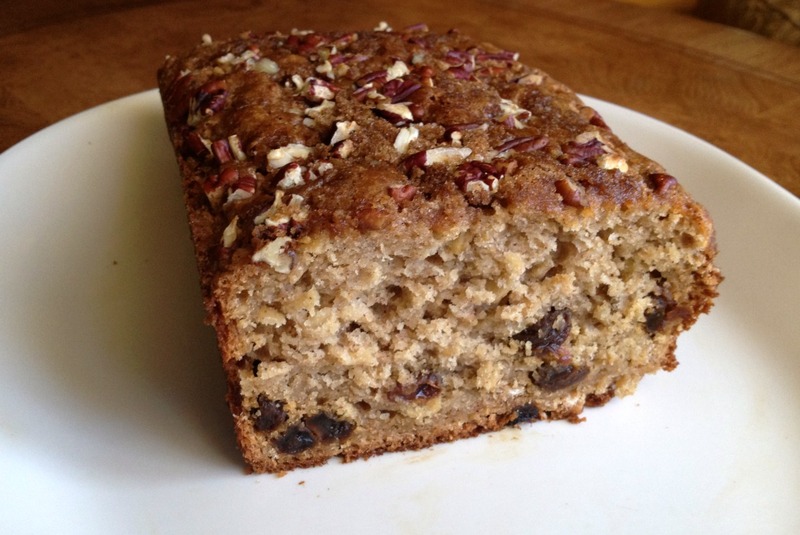 While the loaf is kissed with sugar, it is not at all sweet, so a handful of dried fruit of your choice provides a juicy pop of sweetness and flavor. Oh, and the topping certainly doesn’t hurt. A nutty, brown sugar coating adds crunch, a faint molasses flavor to play off the lightly spiced cake and a gorgeous golden crust. Best of all, it keeps for 3-4 days, so I can assure the whole loaf will be consumed. Now, that’s resourceful! This bread isn’t all that indulgent but next time, I might healthify it some more by swapping have the white flour for whole wheat and nixing the brown sugar from the top. This cake is very forgiving and that should work just fine. The first time you make it though, I encourage you to try it as written, because it is surprising and delicious. Center a rack in oven; preheat to 350°F. Butter 9-by-5-inch loaf pan, dust with flour, and tap out excess. Put pan on a baking sheet. Make the topping: In a small bowl, use your fingers to toss together the sugar, nuts, and cinnamon until evenly mix. Set aside. Make the bread: Whisk together the eggs, applesauce, oil, and buttermilk until well blended. In a large bowl, whisk together the flour, sugar, baking powder, cinnamon, baking soda, salt, nutmeg, and cloves. Remove 1/2 teaspoon of mix; toss it with the fruit to coat. Set aside. Stir the oats into the bowl. Pour the liquid ingredients over the dry, and, using a large rubber spatula, stir just until everything is evenly moistened. Don’t overdo the mixing. Scatter the dried fruit over batter and stir it to blend. Scrape batter into pan; sprinkle over topping, tamping it down lightly with fingers so it sticks. Bake 55 to 65 minutes, or until the bread is browned and a thin knife inserted into center comes out clean. Transfer bread to a cooling rack for about 5 minutes. Run a knife around the sides of pan and unmold. Invert and cool to room temperature right side up. I love cleaning out the pantry. It’s so cathartic. This sounds like a wonderful recipe. I’d eat it any day. I might have to make this for my morning breakfasts! Look s a whole lot better than a simple bowl of oatmeal! I love a good pantry recipe. 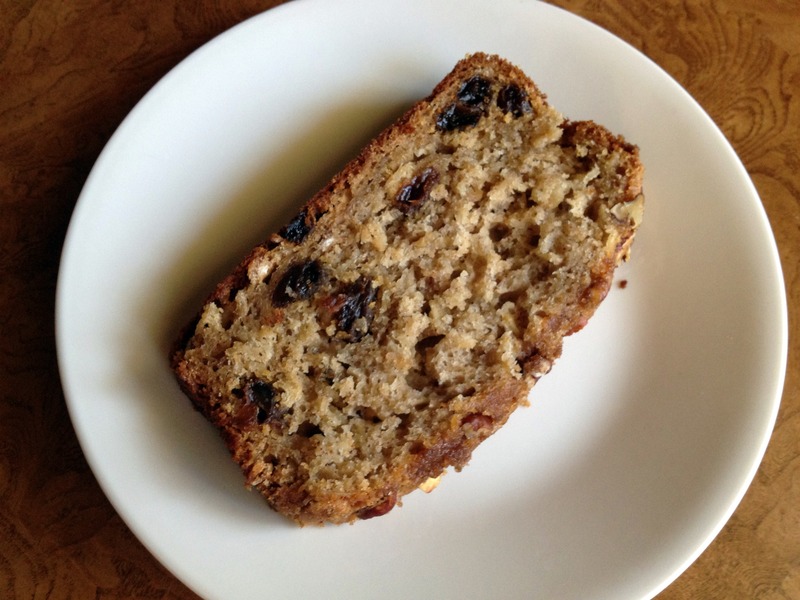 And it sounds like this bread — although I almost want to call it a cake — with all its dried fruit, doesn’t even need a lick of butter or dollop of jam. Yum!